This particular heating jacket is suitable for a standard 210 litre capacity drum/ container & is ATEX and IECEx certified (Zones 1 and 2). 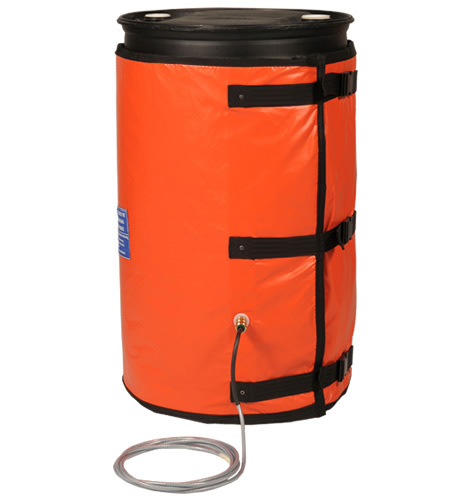 Safe heating of 210l drums (steel and plastic), even in hazardous areas. Ideal for gentle warming and to avoid winter freezing. The heating jacket is ATEX and IECEx Zone 1 and 2 rated, suitable for hazardous environments. It is constructed with custom elastomer and silicone coated glass cloth materials and high density fibreglass insulation. The heating medium uses a patented technology of carbon rich semi-conducting positive temperature coefficient membranes. Safe operating conditions are maintained even in the presence of potentially explosive gases. No transformers are required as it operates using standard ac supply voltages. This heating jacket is ideal for gentle warming and to avoid winter freezing. For faster heating rates and melting solids at higher temperatures, the Thermosafe Induction Heater is recommended. Fitted with adjustable quick release buckles for ease of installation and removal.